Hey wanna finally see my cabinet?? Re:Hey wanna finally see my cabinet?? Even though you dont like me and bash around most of the time. I would say my honest opinion..you cabinet looks pretty good.. It REALLY looks like a converted midway cabinet. and now I remember something as well.you were to dude asking tv question almost about a year ago am I right? thats your 24" wega as far I could remember(I red it somewhere). where did you get that G I JOE font? is that even a font or you just created a banner like that..
you know..REAL american hero...err...website ;Dits very cool(the banner). Hey, that's a great cabinet. Are you planning on making any sort of bezel to hide the silver TV? 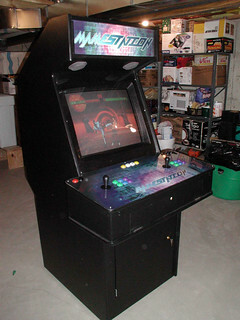 I thought about using a flat screen for mine, but went with rounded cuz it looks more like a real arcade game. I LOVE that control panel. That's kinda what I had in mind for mine actually, except I was planning on making it rectangular with rounded edges. Great job recreating the Midway look! Top job Jakobud. Any chance on putting some of your plans on the site? The pics of the inside of the panel shows a small gap between the panel and the cab, is this normally there? Also how do you keep the lid of the panel down? Great looking piece of craftmanship... One question though... Where's the bezel!? VERY nice, jakobud. i'm in the process of putting together a 4-player CP for a future cab, and the layout i came up with is very similar to yours. i much prefer the 4-player 'all-in-a-row' CP over the 4-player 'wraparound' CP. nicely done. i think the only thing i would/will do differently is to make the 3-1 & 2-4 joysticks equidistant from each other, for a nice Smash TV setup.. other than that, i love it! do you have the dimensions of your CP?? Yes it's scratch built. I will take pictures of the internals if you want me to prove it I was originally aiming for the Midway design but then I found LuSid's cabinet and I 'loosely' based them off of that. I say 'loosely' because I definately had to make adjustments for my tv size. And the internal frameing of the cabinet is all custom. The GIJoe font...I can't remember. I think www.acidfonts.com. Can I put up some plans for my cabinet?? Well maybe....in the beginning of course I had the whole thing layed out on paper with perfect plans but ended up making many adjustments here and there on the fly as I was building.... I will try to put together some plans someday if enough people are really interested. I didn't want to put a bezel on my tv because I actually really like the look of the TV. It's got this shiny brushed crome finish look to it and IMO I just dug it too much to cover it up. After making that decision, I also decided to use the TV speakers as the primary speakers also. Yeah there is a very slight gap between my CP and my cabinet. I guess this just came from inperfect construction or something. When the top of the control panel is closed you can't see this gap at all. If people aren't going to see the gap then I wasn't too worried about fixing it. As long as the CP is secure on the cabinet I was satisfied. My CP is roughly 42" wide, 13" deep, and 6" tall. Oh yeah, and mkdevo, good eye on seeing that the joysticks are not equidistant from eachother. The reason I did this is because I wanted to space out all the joysticks based on the position of their corresponding buttons. 42" was already a hella wide CP and I wasn't about to throw in blank space between player 1 and 3 just to make it the same distance as player 2-4. Anyways, SmashTV feels absolutely perfect on this thing, no matter which player you are playing. The Mame logo looks awesome, great job. I may have to beg for that artwork file later! Very slick looking job on the cabinet. Very professional and clean looking finish on the whole thing. My only complaint would be spacing when playing 4 player games, but oh well. I think that's the first cabinet I've seen use a 24" Sony Wega, very very awesome, I love my 20" Sony. My only question, or request maybe, would be if you could take some pictures of how you mounted the computer in there. Cause I know you used a Micro-ATX, but I'm curious as to whether you went with a full size power supply, or you used one of those mini-power supplies I always see on Micro-ATX computers. -Also, if you like Bomberman 94 so much, definitely give Mega Bomberman for the Genesis a try, you'll thank me later. 1-player is REALLLy good. Gens is the best Genesis emulator out there, and is actually updated sometimes, which is suprising for such an old system's emulator. thanks for the info, jakobud.. yeah, i'd figure smash tv would feel fine either way... i think for me it's more of a cosmetic thing than anything else.. of course, we'll see how i feel once i actually have it all laid out in front of me.. I will try that Genesis Bomberman you recommended. Thanks!